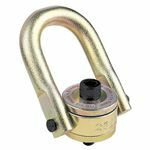 The HR-125M (metric) series of hoist rings is one of the most popular that Crosby makes, and there are several sizes and capacities to choose from. All components are made from alloy steel. You achieve a 100% rating when lifting at a 90º angle. Each ring is load-rated and fatigue rated. Also, each ring is 100% individually proof-tested to 2-1/2 times the Working Load Limit. You will also find a Product Identification Code (PIC) for material traceability. When you need to lift at an angle, you will find useful the 360º swivel and 180º pivot action. Finally, the hoist rings are finished with zinc plating for corrosion protection.